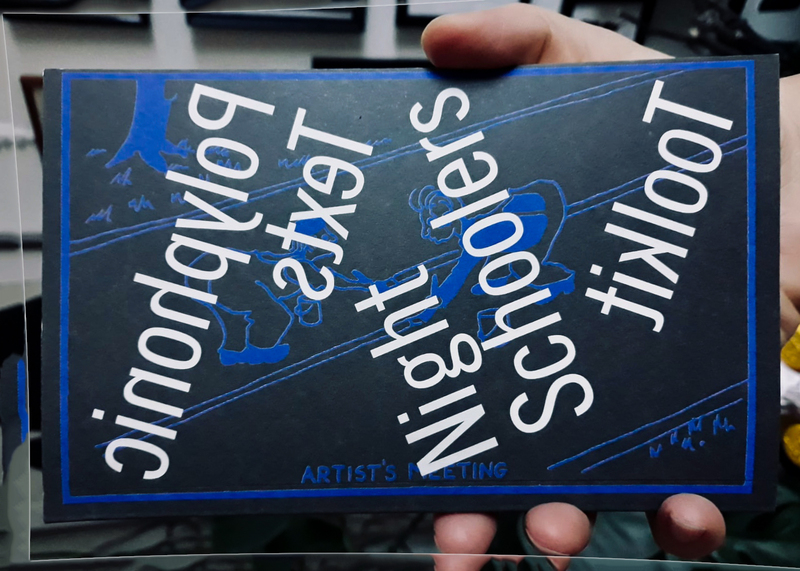 The Polyphonic Texts & Toolkit book gathers a collection of texts written by Night Schoolers during 2016–2018. It serves both as a memory and a toolkit of some of the practices Night Schoolers engaged with during this period, which were focused on collectivising, experimenting, and equalising forms of practice to reflect on alternative models of organising within the art field. It also delves into the complexity of addressing or defining a group and its dynamics, and operates as a way to share our collective questions and processes in the spirit of expanding them to the collectivity beyond. Night Schoolers gathers Giovanna Esposito Yussif, Minna L. Henriksson, Elina Juopperi, Karolina Kucia, Christine Langinauer, Lauri Antti Mattila, David Muoz, Minna Pöllänen, Martta Tuomaala, and Elina Vainio. The necessity of coming together got consistent during spring 2015. We started to get organised after a series of meetings that gathered a loose group of slightly frustrated individuals, eager to share experiences or voice problems concerning the current labour legislations, lack of representation by the art ‘unions’ (i.e. associations), exploitative practices in the art field, and the fracturing social and welfare fabric. We recognised that an urgency in art—as in any other forms of labour—is to unite; spread tasks; redistribute wealth and power; and together find sensible forms of knowing, belonging and becoming collectively. We kept on meeting regularly with the aim of redefining our relations to the material conditions within which we are embedded. The publication will be for sale for a price of 7 euros. It will be available at the launch or by contacting any of the group members. Snacks and beverages will be served, welcome!